The power of memory - I have confidence in confidence. Notwithstanding the quite stunning story of the author's success itself, this book is quite an enjoyable read in itself on remembering - the history, personalities, and more. This is not a handbook on memory-enhancing tricks and techniques though, be forewarned. It is easy to forget. If it weren't, we would likely all have gone mad a long time ago. However, not being able to remember is also a curse. Remember where you kept the car keys? And then you have people, normal enough, who have stunning powers of memory that inspire awe among us. People who can perform feats of memory we would consider outside the bounds of humanly possibility. We consider such people to be savants, geniuses, different-from-us. However, that is not necessarily the case. The advent of industrialization and the faux feelings of omnipotence that machines inspired among humans led to a devaluation of the powers of human memorization. The ability to develop one's memory was seen as a vestige of a less-developed era. The power of the internet is ensuring that such thoughts are only being perpetuated further. This book then also serves as a timely reminder about the powerful mass of jelly that sits atop. Once upon a time, every literate person was versed in the techniques Ed was about to teach me. Memory training was considered a centerpiece of classical education in the language arts, on par with grammar, logic, and rhetoric. "Ancient and medieval people reserved their awe for memory. Their greatest geniuses they describe as people of superior memories," writes Mary Carruthers, the author of two books on the history of memory techniques. The externalization of memory not only changed how people think; it also led to a profound shift in the very notion of what it means to be intelligent. Internal memory became devalued. I first saw and heard about the author on the The Colbert Report in March of this year (link to video). It was a fascinating story. 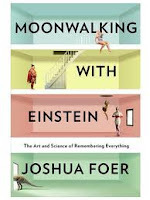 They author, Joshua Foer, a journalist, went to cover the US Memory Championship in 2005, was intrigued, challenged, eventually trained by one of the competitors, and then went on to win the championship. One year later. Yes, he won the 2006 US Memory Championship. This book, then, is an account of his one year journey from regular journalist to memory freak. So what kind of memory muscles does the memory championship test? Different kinds of tests seek to test different kinds of muscles, so to say. Can you memorize a deck of playing cards in a minute. No, make that under a minute. Memorize a sequence of random numbers - hundreds of them, in a few minutes. Memorize a number of random faces and then identify them by their names. Memorize an unpublished poem. And so on. Rather than make this a linear narrative about the author's travails, what makes this book far more interesting than it otherwise may have been is that the author delves into the human brain. Specifically he seeks to understand how the brain remembers, forms memories, and then retrieves those memories. Since the topic covers how memories are formed, it is but natural that the book also cover the two extremes of the scale - people who had super-human memorization capabilities on the one end, and people who could not remember at the other end. The sufferers in this second category have been well documented and also made famous in such movies as Memento (DVD , Blu-ray) and the Hindi (or 'Bollywood' if you please) blockbuster 'Ghajini ' (DVD , Blu Ray ), and more recently in the book, Before I Go To Sleep . The secret to building an Arnold-like memory physique, it turns out, is in training. In deliberate practice. In being focused. Simple as that. Anyone willing to put in the time, and that too not a huge amount of it at that, can improve their powers of memorization by an order of magnitude. Yes. I was willing to believe Buzan when he said there were techniques that one could learn to marginally improve one's memory around the edges, but I didn't fully believe him (or Ed) when he said that any schmo off the street could learn to memorize entire decks of playing cards or thousands of binary digits. The alternate explanation just seemed a whole lot more plausible: that Ed and his colleagues had some freakish innate talent that was the mental equivalent of André the Giant's height or Usain Bolt's legs. The interesting thing is that even as we have got to learn more about our brain and its incredible complexity, our respect for its abilities seems to have devalued. We keep comparing it to a computer, initially, and then to the connected web that is the internet, and the amazing vastness of the Internet causes us to believe that the human brain pales in size, complexity, and capability. Which is not the case... The number of connections that the neurons in our brains can make with each other is so vast a number that it truly approximates our notion of infinity. And this is not a static piece of jelly that we are talking about either. What we see, learn, and remember itself can change the brain. The brain, its actual physical structure, can change in response to our learnings and memories. This is truly an astounding insight that we do not fully comprehend. The three-pound mass balanced atop our spines is made up of somewhere in the neighborhood of 100 billion neurons, each of which can make upwards of five to ten thousand synaptic connections with other neurons. The brain is a mutable organ, capable--within limits--of reorganizing itself and readapting to new kinds of sensory input, a phenomenon known as neuroplasticity. As I was combing the scientific literature, one name kept popping up in my research about memory improvement: K. Anders Ericsson . He was a psychology professor at Florida State University and the author of an article titled "Exceptional Memorizers: Made, Not Born." In 1981, he and fellow psychologist Bill Chase conducted a now-classic experiment on a Carnegie Mellon undergraduate, who has been immortalized in the literature by his initials, SF. Chase and Ericsson paid SF to spend several hours a week in their lab taking a simple memory test over and over and over again. At the outset, he could only hold about seven digits in his head at a time. By the time the experiment wrapped up--two years and 250 mind-numbing hours later--SF had expanded his ability to remember numbers by a factor of ten. The experiment shattered the old notions that our memory capacities are fixed. The narrative proceeds along basically two parallel tracks. One is an account of the author's efforts as he worked to improve his memory, his ability to memorize what would essentially be random sequences of numbers, or faces, or lists. The other track is what the author digs through and finds about memory. The history of it, the people who have studied it, and its extraordinary achievers and equally striking sufferers. It turns out that we actually cannot remember more than a few items for more than a few seconds, unless, that is, we make a conscious effort to memorize those items. This effort can be byway of repetition, by association, or by some other means that allows this memory to become entrenched in our brain for a longer period of time. This magic number, of the number of items we can retain in our working memory, is seven. Give or take two. In 1956, a Harvard psychologist named George Miller published what would become a classic paper in the history of memory research. His paper was titled "The Magical Number Seven, Plus or Minus Two: Some Limits on Our Capacity for Processing Information." Miller had discovered that our ability to process information and make decisions in the world is limited by a fundamental constraint: We can only think about roughly seven things at a time. So what about chess players - grandmasters, for example, who can play twenty or more players at the same time, and usually end up beating all of them? And some even play these games blindfolded?! How on earth could they memorize the hundreds of positions on the chessboards, and then figure out what the situation is on each board, cogitate and calculate the next move to make? Fascinating? Yes.What is even more fascinating is the insight that the way these chess players approach these multi-player games is not by memorizing the position of each piece on the board, but by associating the chessboard with a similar board from their memory. They would have likely come across such a position of the pieces on the board at some time in their careers, and when they come across this same position again, they simply recall it from their long term memory and figure out the next move to make. But the most striking finding of all from these early studies of chess experts was their astounding memories. The experts could memorize entire boards after just a brief glance. Using magnetoencephalography, a technique that measures the weak magnetic fields given off by a thinking brain, researchers have found that higher-rated chess players are more likely to engage the frontal and parietal cortices of the brain when they look at the board, which suggests that they are recalling information from long-term memory. Lower-ranked players are more likely to engage the medial temporal lobes, which suggests that they are encoding new information. The experts are interpreting the present board in term of their massive knowledge of past ones. The lower-ranked players are seeing the board as something new. People looking to read this book to get a how-to compendium of steps to follow and supersize their memories will be disappointed, because this book is not it. What this book however is is a lucid dive into the structure that is the human brain. By understanding our brains, and how we form memories, we can perhaps learn to respect its capabilities, and then harness it in a positive manner. And perhaps, just perhaps, we will remember where we last placed the car keys. Maybe. Some details about what exactly is the World Memory Championship. Unlike the U.S. championship, which has just five events, none lasting longer than fifteen minutes, the World Memory Championship is frequently referred to as a "mental decathlon." Its ten events, called "disciplines," span three grueling days, and each tests the competitors' memories in a slightly different way. Contestants have to memorize a previously unpublished poem spanning several pages, pages of random words (record: 280 in fifteen minutes), lists of binary digits (record: 4,140 in thirty minutes), shuffled decks of playing cards, a list of historical dates, and names and faces. Some disciplines, called "speed events," test how much the contestants can memorize in five minutes (record: 405 digits). Two marathon disciplines test how many decks of cards and random digits they can memorize in an hour (records: 2,080 digits and 27 decks of cards). The brain is a costly organ. Though it accounts for only 2 percent of the body's mass, it uses up a fifth of all the oxygen we breathe, and it's where a quarter of all our glucose gets burned. Socrates goes on to disparage the idea of passing on his own knowledge through writing, saying it would be "singularly simple-minded to believe that written words can do anything more than remind one of what one already knows." Oh yes, what about some tricks and techniques to build up your memorization skills? Well, there is some mention of it, to be sure. I used a technique known as the "Major System," invented around 1648 by Johann Winkelmann, which is nothing more than a simple code to convert numbers into phonetic sounds. Those sounds can then be turned into words, which can in turn become images for a memory palace. ... most mental athletes use a more complex technique that is known on the Worldwide Brain Club (the online forum for memory junkies, Rubik's cubers, and mathletes) as "person-action-object," or, simply, PAO. It traces its lineage directly back to the loopy combinatorial mnemonics of Giordano Bruno and Ramon Llull. In the PAO system, every two-digit number from 00 to 99 is represented by a single image of a person performing an action on an object. "I don't use the word `memory' in my class because it's a bad word in education," says Matthews. "You make monkeys memorize, whereas education is the ability to retrieve information at will and analyze it. But you can't have higher-level learning--you can't analyze--without retrieving information." And you can't retrieve information without putting the information in there in the first place. The dichotomy between "learning" and "memorizing" is false, Matthews contends. You can't learn without memorizing, and if done right, you can't memorize without learning. This below is a point that Nicholas Carr makes time and again in his book: that knowing makes you capable of knowing what more to know, so to say. Meta-cognition. ...you can't have understanding without facts. And crucially, the more you know, the easier it is to know more. Memory is like a spiderweb that catches new information. The more it catches, the bigger it grows. And the bigger it grows, the more it catches. In closing, the best summary of the book is written by the author himself. A cliched expression perhaps, when he says "practice makes perfect", but one that has to be qualified by research that has demonstrated again and again that practice needs to be "concentrated, self-conscious, and deliberate." My experience had validated the old saw that practice makes perfect. But only if it's the right kind of concentrated, self-conscious, deliberate practice. I'd learned firsthand that with focus, motivation, and, above all, time, the mind can be trained to do extraordinary things. This was a tremendously empowering discovery.